LAKELAND, Fla. (January 19, 2015) – Nearly three dozen Florida Polytechnic University students and officials descended on the Capitol Tuesday to share their vision for the future of research and innovation at the state’s only university dedicated exclusively to STEM (Science, Technology, Engineering and Mathematics). Students met with lawmakers to discuss the need for an on-campus applied research facility that will allow faculty, students and private sector researchers to focus on solving important, real-world challenges. 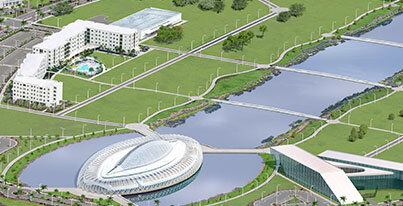 With an emphasis on industry-responsive innovation, the facility would provide additional laboratory space, as well as an entrepreneurship center to assist with the commercialization of the products and systems created from the university’s research. Researchers would get the support they need to start companies, patent their inventions and create high-paying, high-tech jobs. Florida Poly emphasizes real-world problem-solving, work experience, applied research and business leadership opportunities through industry partnerships to ensure students graduate ready to succeed in the workplace. The University collaborates with more than 90 industry-leading firms to produce a market-inspired curriculum designed to meet both near-term and long-term workforce needs. Students are engaged in research and entrepreneurial activities as early as their freshman year. Last year, freshmen pursued projects in energy sustainability, cyber security and robotics, and some students have already received provisional patents for their work. Florida Poly staff members and leaders, including President Dr. Randy K. Avent, also traveled to the State Capitol for the event. In addition to meeting with legislators, several Florida Poly students will be exhibiting their award-winning Biology class projects in Florida’s Capitol. A Lily pad structure that collects photovoltaic and thermal energy from the sun and an energy harvesting hiking boot are among the projects that will be on display.